(Newser) – Police have uncovered one big clue but no answers in the search for a 31-year-old Virginia woman who was last heard from on Wednesday. 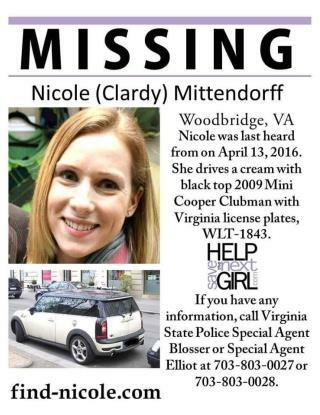 Nicole Mittendorff's 2009 Mini Cooper was found Saturday night in what the Washington Post describes as a "remote area" of the Shenandoah National Park; it was left near the Whiteoak Canyon Trail, which is close to Old Rag, described by the National Park Service as Shenandoah's "most popular and most dangerous hike." Some of Mittendorff's family suggested it's possible she was headed to the area to do a trail run, something she reportedly regularly did. Fox 5 DC reports authorities have said that nothing yet indicates something "suspicious in nature" occurred. Lots of possibles. Human or animal predator, or she slipped and fell. Ladies, do not run alone bring a German shepard or go to the gym. This is all too familiar...Women making bad decisions.